A major update to Google Maps has just hit the Android market. 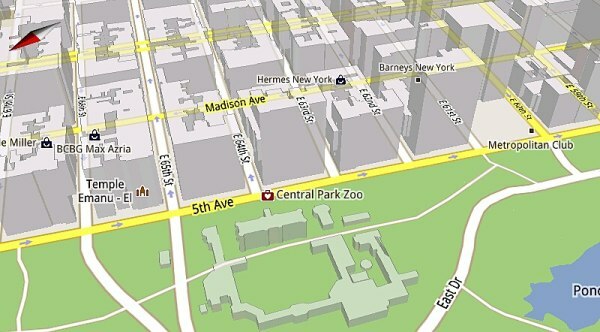 Version 5.0 of the Google digital map software brings in vector graphics, cool new 3D features and offline navigation. So starting today instead of a series of small stitched together image tiles, Google Maps will be dynamically drawing vector graphics. This means that instead of pre-rendered images, Maps are rendered on the device itself, making scaling and transitions way smoother. Next come the 3D interactions that are possible thanks to the two newly implemented multi-touch gestures. Dragging down with two fingers will tilt the map and switch between 2D and 3D view, while twisting your fingers will rotate the map. There’s also compass mode enabled in Google Maps 5.0 allowing you to look around by simply panning around with your phone. Finally there’s the offline navigation or as the Google dev team calls it “offline reliability. It allows Google Maps to reroute you if you leave your initially calculated track even if you don’t have internet access during navigation. You still need internet access before you start navigating though. Google Maps 5.0 is available to Android devices running version 1.6 (Donut) or later but the 3D features and offline navigation are only accessible on 2.0+ (Eclair) handsets. Now start updating!